Posted by Remi Stud on 27/06/2018. The Remi Stud Young Rider Scholarship is an annual scholarship and is awarded to a very deserving Young Rider who has the talent and dedication in either Dressage, Eventing or Show Horse but needs financial assistance to purchase a horse of their dreams. 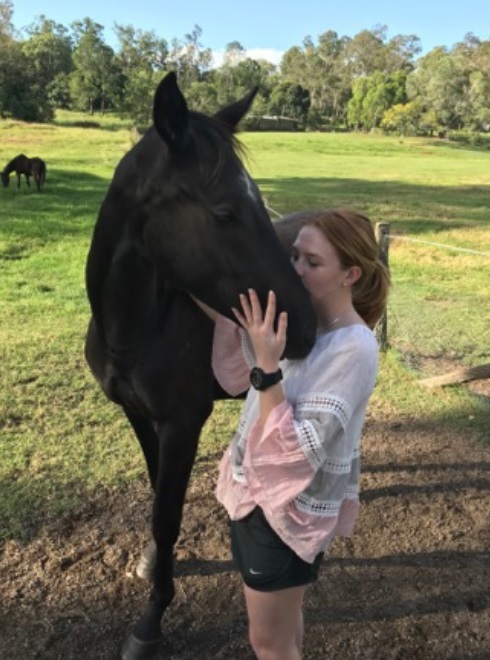 Every year the dream comes true for one lucky young rider as the scholarship includes the ownership of a purpose-bred weanling foal by one of the best performed Hanoverian stallions in Australia. The Remi Stud Young Rider Scholarship for 2017 was awarded to a dressage rider, Olivia Ruzsicska from Humpty Doo in the Northern Territory. She received a stunning colt by Lauries As (imp)/Belissimo M – Remi Lazzarini S (Oscar). Lauries As (imp) needs no introduction, but Oscar is also from a very successful competition mare line, the family of Remi Lambuca. This family is the original mare line tracing back 4 generations of Remi Stud breeding. Oscar will no doubt suit Olivia’s dressage aspirations. Olivia started riding at 18 months old when her Auntie Karen popped her on a pony called Pebbles. She went to Pony Club, attended local agricultural shows in leadline classes on Pebbles in Darwin, progressed to her first dressage test off lead at 5 years old, and she has now won multiple rider and dressage classes on ponies as she grew up. Due to geographical challenges, Olivia’s dedication to her sport presented many difficulties, not the least needing to travel thousands of kilometres to support her dream if she was to compete. Living in Humpty Doo in the Northern Territory meant isolation from mainstream events on the eastern seaboard, and many hours on the road required to compete seriously, but over the years Olivia’s dream has turned out to be a real family affair with Mum as strapper, Dad as chauffeur, stable builder, and sometimes strapper, and Olivia’s brother, Bradley, as the freestyle designer and home support when they travel away. Olivia had applied for the Remi Stud Young Rider Scholarship 4 years in a row before being awarded this life-changing opportunity in 2017. "Oscar didn’t go far from Remi Stud, just to Pullenvale, he is loving his time there at Nekarboo. He is very affectionate and comes running when I call him and he loves getting scratches and just cuddling with me. Oscar is already a very quick learner as when I was last down in Queensland I did simple things with him such as walking when I wanted him to walk and getting him to stop when I wanted to stop, it may seem like a simple task but after a while he can get distracted and the aim of this was just to get him to listen to me and not try to be naughty, I also did things while the farriers were there so he learnt to stand still with them and to be patient. Oscar is progressing well and is already growing into a beautiful horse, I cannot wait to start riding him and start the training process. He is a very elegant horse and is all leg and he already is showing a magnificent neck like his father. The one thing that stood out for me when I first saw Oscar was his face and his kind eyes, even though we have not had that much time to bond I can already feel a connection being made with him. I am so thankful that he is still a little sooky baby as I get to cuddle and kiss him. It is still a shock to me as to how I won and I feel very special knowing that I have this beautiful horse to move on to. I love telling everyone about the scholarship and showing off Oscar (I mean how could you not). I am excited to finish year 12 and start the hard work with Oscar and see where we take each other, I cannot encourage people enough to apply for the scholarship, as even if they feel as though they do not have a chance they should always go for it, because they may just end up like me, a Territory girl who didn’t think she stood a chance, to now being able to write you a report on how Oscar is going. Thanks for everything." Apply now for the Remi Stud Scholarship 2018/19, a unique opportunity. Click HERE.